The San Antonio Food Bank’s new Mobile Mercado rolled onto the St. Mary’s campus Oct. 7, 2016, to add flavor to the monthly farmers’ market held on campus. 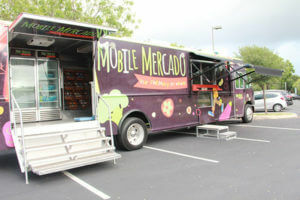 The Mobile Mercado was initially set to come to St. Mary’s in late 2015, but the St. Mary’s University Sustainability Committee instead planned several farmers’ markets — sans the Mobile Mercado — for the University and surrounding community to purchase fresh fruits, vegetables and more. But the long-awaited appearance of the Mobile Mercado bus — carrying a variety of canned, boxed and frozen foods — as well as the presence of local vendors and artisans selling items like artwork and organic soap, was the work of the Sustainability Committee paying off. While a rain cloud made for wet conditions in the early part of Friday’s event, it wasn’t enough to stop people from shopping. 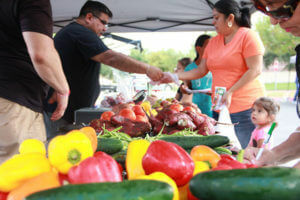 While the Mobile Mercado “is an important part of how St. Mary’s University is working with the San Antonio Food Bank to help alleviate food insecurity in our area,” said Evelynn Mitchell, Sustainability Committee chair and Associate Professor of Environmental Science, it also represents the University’s commitment to working for the greater good. “As Pope Francis has shown us through Laudato Si (his second encyclical), working to help those of lower economic status is the best path forward to a sustainable world,” Mitchell said. According to Duesterhoeft, the Sustainability Committee hopes to bring the Mobile Mercado back to campus in future months, while the farmers’ market will continue to be held in Lot G the first Friday of each month.